What happens when federal officials try to accomplish goals that depend on the resources and efforts of state and local governments?Focusing on the nation's experience with the No Child Left Behind Act (NCLB), Manna's engaging case study considers just that question. Beyond the administrative challenges NCLB unleashed, Collision Course examines the dynamics at work when federal policymakers hold state and local governments accountable for results. Ambitions for higher performance collide with governing structures and practices. Were the collisions valuable for their potential to transform education policy, or has the law inflicted too much damage on state and local institutions responsible for educating the nation's youth? The results have been both positive and negative. As Manna points to increased capabilities in states and localities, he also looks at expanded bureaucratic requirements. 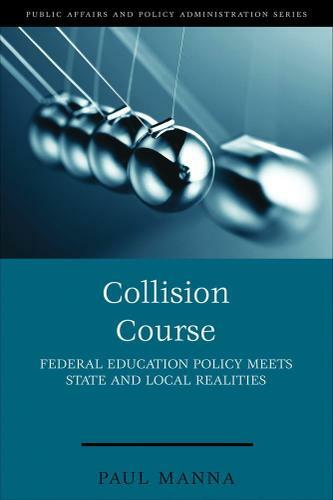 Collision Course offers a balanced and in-depth assessment of a policy that has sparked heated debate over a broad expanse of time- from NCLB's adoption through its implementation to the Obama administration's attempts to shift away.Federalism, the policymaking process, and the complexity of education policy all get their due in this accessible and analytical supplement.